The value of pipe #427 is n/a points. Rita Baumgartner offered this pipe on eBay. It was photographed as a very dark green and described as "mint" condition, so I bid and won. 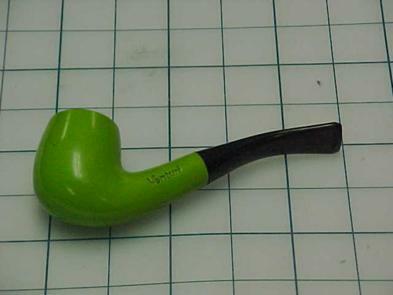 When I got the pipe it was the usual green in less than mint condition and, thus, no improvement to the collection. I decided to offer it on the Pipes for Sale page in hopes that someone else will be able to enjoy it. Al Eckhoff took me up on the offer and it is now his. The contents of this site are Copyright © 1996—2018 by Billie W. Taylor II, Ph.D. World Rights Reserved. The copyright holder specifically prohibits reproduction, transmission, duplication or storage of these pages or any portion thereof in any electronic or physical medium, under any circumstances. Please contact me for reproduction rights if you'd like to reproduce all or part of this site. If you like this page and wish to share it, you are welcome to link to it, with my thanks. Please notify me of any difficulties displaying this page; include device brand, operating system name and version, and browser name and version. Meanwhile, try the Site Map.